The collectible pins will be designed by Penny Arcade. Back in our hunter-gatherer days, collecting helped us stave off death one more day. Now, it's just a way to earn a cheap shot of endorphins and some precious social status. Game developers have long been exploiting this ancient part of our brains with hidden unlockables and achievements, but Microsoft is taking things one step further with its upcoming fighter Killer Instinct. Instead of pewter figurines and art books, the Pin Ultimate Edition comes with real-world collectibles. The special edition will come with two collectible pins and a folio with room for many more. The pin designs are coming courtesy of Penny Arcade, who have done something similar at PAX with its Pinny Arcade program. Microsoft is treating Killer Instinct like an e-sport, complete with multiple seasons. Each season will bring new characters to play with and pins to collect. While you'll be able to purchase pins separately, some will be handed out as part of promotions or even unlocked "through your community and in-game efforts." The Pin Ultimate Edition includes early access to all season one content, as well as a few accessory packs. 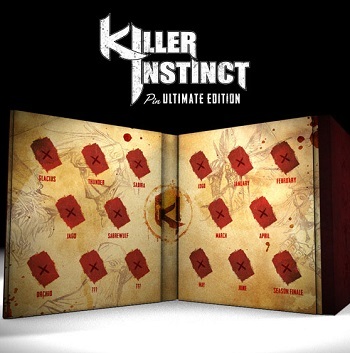 Killer Instinct launches for the Xbox One on Nov. 29th, and the Pin Ultimate Edition can be pre-ordered for $59.99.